I think you’ll all agree that flat hunting is a fairly stressful experience, especially when you’re a little anally retentive and have a fairly specific list of what you’re looking for, in my case this ran to enough outside space to build a clay oven (i can see that you’re thinking i’m off my rocker, and, whilst that may be the case, you know you’ll be begging to be my friend when alex and i are churning out the freshly baked pizzas so don’t even try and deny it). Another thing that was fairly high on my list was a dishwasher. Now i love my boyfriend to bits and he is a fantastic chef but i can honestly say that i have never met anyone more messy when cooking. He manages to use every single bowl, plate, knife, spoon and board we own and as a result, him, me and no dishwasher isn’t a pretty sight. So on Tuesday, Alex and i hopped on a train left the quiet solitude of the country and headed for the big smoke. The morning was spent traipsing around some fairly unsatisfactory flats, we couldn’t seem to find anything that had both a nice kitchen and some outside space, it was always one or the other and i was beginning to get a little annoyed (i’m not known for my patience). Seeing as we had an hour or two to spare before our next viewing we decided to grab some lunch. We were in Fulham so decided to amble up the road to The Butchers Hook, just opposite chelsea football stadium. Don’t worry, it’s not a footbally pub, it’s a foodie pub, you’ll be more likely to find people sprawling on the big communal table reading a paper than chugging beer and chanting football songs (although they do have a pretty good selection of beers on tap). This is one of my favourite restaurants in Fulham, it’s got such a great atmosphere, really warm and cosy in the winter but with outside tables in the summer. It’s also got a really nice wine list and a knowledgeable staff who are happy to recommend something if you can’t make a decision, something that frequently happens to me and i have to say, i’m yet to be disappointed. Anyway, given that it was the middle of the day and we still had more flats to view we steered clear of the wine as there was a fairly strong chance i’d get tipsy and get carried away with some extravagant flat way out of our budget. Luckily there was no reason i couldn’t eat some yummy food. Neither of us were particularly grabbed by any of the mains that day so we decided to share some small plates instead. They have a changing daily menu for lunch and dinner as well as a blackboard of specials that are available all day long, we mixed and matched from both. 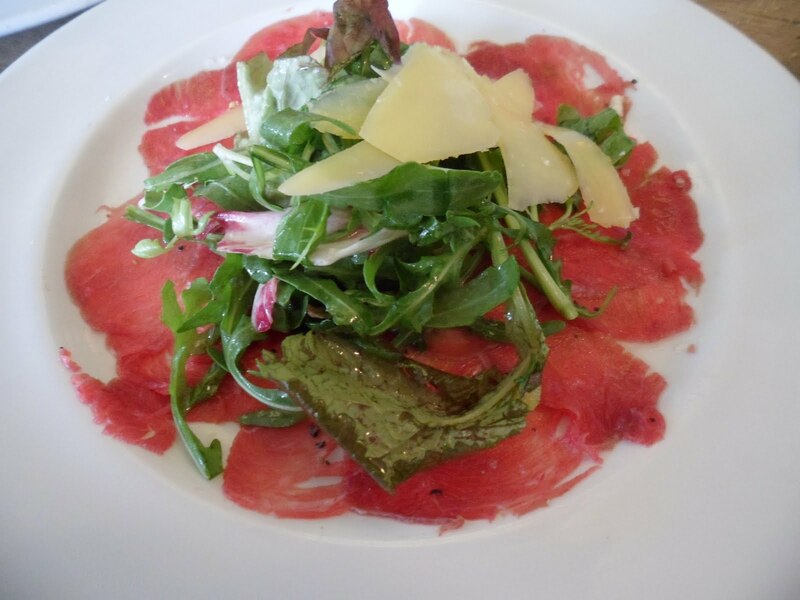 First up we had a beef carpaccio, more because alex had been deprived of such things in thailand than anything else. Now i have to say, i wasn’t blown away by this. It wasn’t that it was bad, just woefully underseasoned, i’m not sure alex cared at this point though, given that it had been so long since he’d had one. 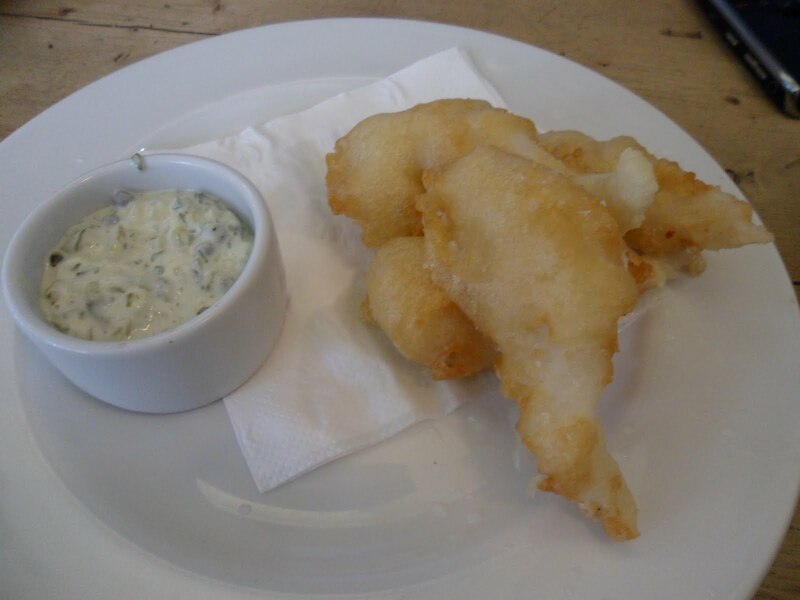 Next up were some whiting goujons (liking the sustainable fish there guys). These were a hit with both of us, meltingly succulent fish encased in a featherlight tempura batter they were crisp and crunchy with a good squezze of lemon and served with one of the best tartare sauces i’ve had the pleasure of eating in a while. Very light and punchy and fresh with a nice zing from the capers, we couldn’t get enough of it. 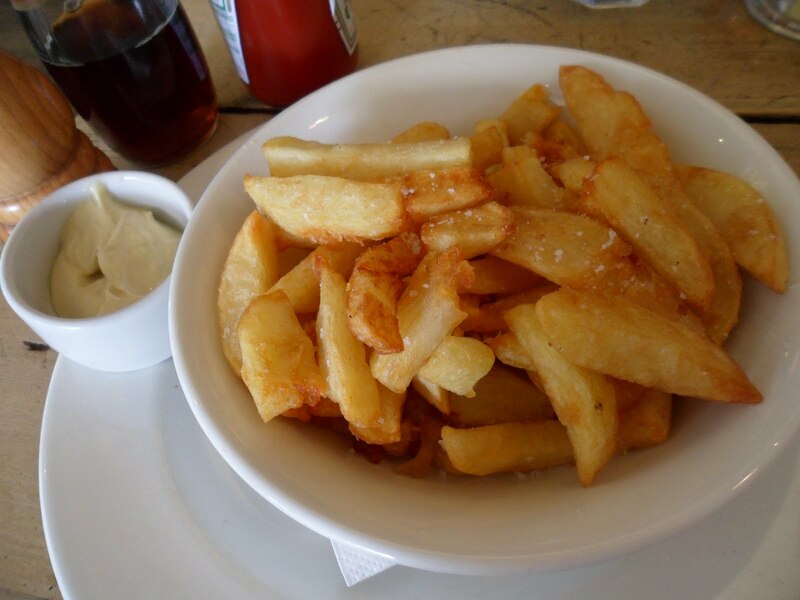 We did also have to get a bowl of chips as i had the craving, and also because i know they come with aioli and a bowl of sea salt which is frankly too much for me to resist. And they weren’t bad, although they could have done with being a little crispier. 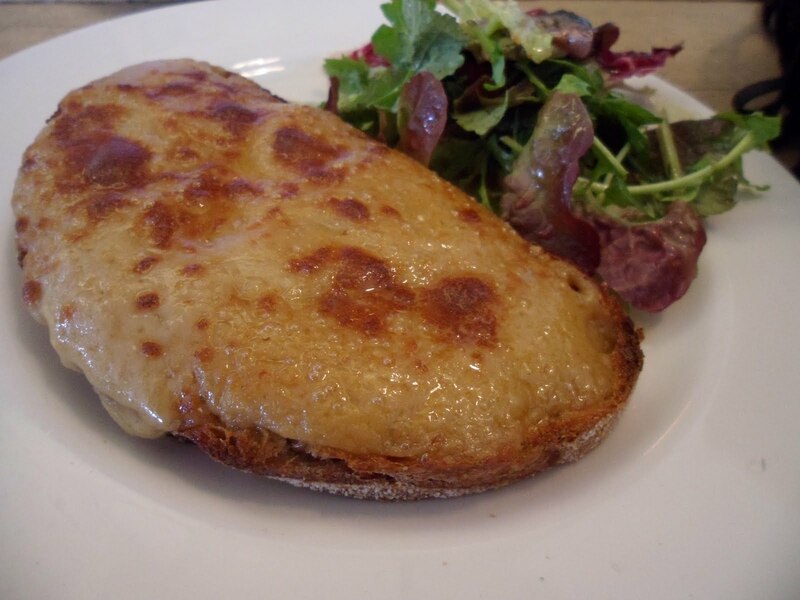 We also had a welsh rarebit as alex had never had one before. In case you don’t know what this is, it’s basically cheese on toast except the cheese is mixed with ale and mustard before being spread on toast and grilled, usually then being finished with a couple of cheeky splashes of worchestershire sauce. Neither of us were 100% sure on this one. Alex just thought it tasted like fondue, i liked it as long as i had some of the salad with it, without, it was a little overpowering in taste and was seriously rich. In short, i would not have wanted a whole one. Last but by no means least was the crowning glory, something i could quite happily have eaten a whole plate of (except it was really rich so i probably couldn’t have). I was a little confused that it was a starter as it was deep and full and i’m not sure how you’d eat a main course afterwards but this is the only fault. It was spectacular. 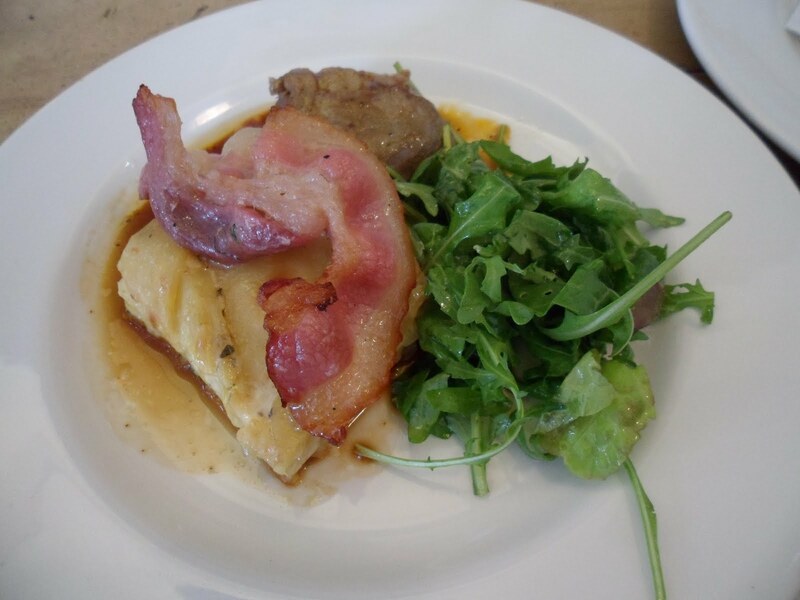 Confit pigs cheek with dauphinoise potatoes and rocket. Di-vine, so divine that as you can see, i felt the need to split the word up for a bit more impact. Now it may not look like much but trust me, it was a good-un, i’m keeping my fingers crossed that it’ll be sitting prettily on the menu next time i’m in there too. Be it a quiet lunch or a big noisy dinner with friends, it’s somewhere i’d definitely recommend, they also do a fantasticly fantastic steak with a glass of wine deal for something silly like £13.95 on sunday nights as well as a daily special with a drink for about £8.95 for lunch/£10 for dinner. Now doesn’t that sound like it’s worth a visit? Oh, and in case you’re wondering, after a couple more days hunting, on thursday we finally found our flat, and it somehow manages to tick every single thing on my ridiculous list.